Swashbuckle and Glitter! – Bounce Sales & Marketing Ltd. Celebrate the release of Princess Pirates: OPAL – The Monstrous Forest with this fab A3 poster. The third in a series of truly action-packed, swashbuckling adventures set in a magical island world. A battle for the world of Lemuria is raging and an evil sorceress called Obsidian is on the brink of defeating the five royal families. Separated from their parents as babies and reunited with each other at an English boarding school, the Princess Pirates use their magical powers to help the people and animals of Lemuria. 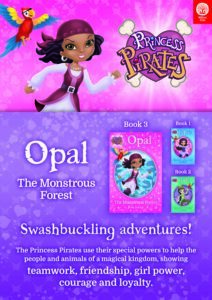 Opal’s power of talking to animals is put to full use as the princesses break the curse and set the island free. Girl power, teamwork, being confident, as well as brave enough to face up to your fears, and apologising for your mistakes, are all demonstrated in this story with pace and energy. Striking line art illustrations and clear typography help to support interaction and interest. Children on the journey of reading alone will develop their reading comprehension with a sense of achievement.